What Types of Gambling are Legal in the state of New Jersey? New Jersey has a bustling gambling industry limited not just to the famed brick-and-mortar casinos of Atlantic City, but also including online gambling, sports betting, fantasy sports, horse racing and more. New Jersey legalized online gambling in February 2013 with a law allowing each of the state’s casinos to partner with software providers to offer casino games and poker to players located within state lines. The majority of Atlantic City’s casinos jumped on the opportunity to launch gambling sites and now players have a plethora of options to choose from. The way it works in New Jersey is land-based casinos hold online gambling licenses and may then partner with third-party software providers to operate one or more independently-branded casino sites. For example, Borgata Casino in Atlantic City offers online gambling through BorgataCasino.com in partnership with GVG Holdings, PalaCasino.com in partnership with Pala Interactive and so on. These various gambling sites all operate off the internet gaming license held by Borgata AC, but all still compete with one another for NJ players. It’s almost taken for granted that most of us have a casino within driving distance today, but that wasn’t always the case in the United States. As recently as the mid-70s, Nevada had an absolute monopoly over casino gambling in the United States. New Jersey set the stage for a change that would eventually impact the entire country when voters approved a referendum in 1976 allowing casinos to operate in Atlantic City. When Resorts International opened on the Atlantic City Boardwalk in 178, it did so as the first legal casino to open anywhere in the US outside Nevada. New Jersey is largely responsible for the widespread legalization of sports betting and deserves a big thank you for its efforts on that front. Prior to New Jersey’s successful push to overturn the federal sports betting prohibition, Nevada was for decades the only state where one could place a legal wager on a game. A constitutional amendment approved by voters in 2011 and a law enacted the following year initiated a lengthy legal battle that eventually resulted in the Supreme Court declaring the Professional and Amateur Sports Protection Act (PASPA) unconstitutional. With PASPA overturned, New Jersey and every other state in the US gained the ability regulate sports betting as it chooses. New Jersey was one of the first states to launch sports betting in 2018. Since then, numerous retail sportsbooks and betting sites have gone live to give residents a variety of options for betting on sports. Mobile sports betting is regulated similarly to online gambling in New Jersey with land-based casinos and racetracks holding sports betting licenses and then partnering with various software providers to operate online sportsbooks. The following chart shows the relationship between each land-based casino and the various betting sites operated by each. Every mobile sportsbook you see below is fully licensed and legal in New Jersey right now. In-person sports betting may take place at casinos and racetracks holding sports betting licenses issued by the New Jersey Division of Gaming Enforcement. Unlike casino gambling, sports betting may take place outside Atlantic City – namely through licensed racetracks. In-person and online poker are both widely available in New Jersey through land-based casinos and regulated gambling sites. In the real world, poker is permitted at casinos. Online poker is allowed at sites licensed by the NJDGE. Online poker was legalized in New Jersey alongside online gambling in 2013. Any land-based casino with an online gaming license is also able to offer online poker if it chooses. There are not as many poker sites in New Jersey as there are online casinos due to poker needing a fairly large population to draw from in order to support active tables, but things are improving on that front. When New Jersey first launched online gaming, all poker sites were restricted to drawing players from New Jersey only, which made it difficult for more than a handful of sites to generate enough action to support a healthy poker economy. However, New Jersey has since entered compacts with other states allowing licensed poker sites in each to share players across state borders. This has significantly improved the situation as now players in New Jersey, Delaware, Nevada and other states can sit at tables with players from other states. This is good for poker sites and players alike as it fosters increased traffic at legal poker sites. As more states legalize online poker and enter similar compacts, traffic will improve across the board. Legal in-person poker games can be found at certain Atlantic City casinos. Every poker room has its own style and perks, but the Borgata stands out as one of the very best in the region. The Borgata has dozens of tables and high stakes cash games in addition to hosting major tournaments on a regular basis. Moving outside of Atlantic City, your options for live poker diminish significantly. NJ gaming law does not appear to make exceptions for home games and there are no other licensed poker rooms in the state. If you live in the north or eastern portions of the state, Philadelphia and its poker rooms may be more convenient. The New Jersey criminal code appears to outlaw all home poker games, but the law is a bit fuzzy in this area. Our understanding is that all home games are illegal, even if no rake is taken. However, there is definitely no question games run for a profit in New Jersey are at risk of enforcement action. Raids on organized poker games do happen from time to time. All wagers, bets or stakes made to depend upon any race or game, or upon any gaming by lot or chance, or upon any lot, chance, casualty or unknown or contingent event, shall be unlawful. In some states, exceptions are made for home poker games as long as the operator of the game does not charge a rake or seek to make a profit. That does not appear to be the case in New Jersey. The only exception to the afore-mentioned prohibitions of gambling are made in § 2C:37-9 (2013) for games organized within the scope of the Casino Control Act, which was passed to regulate land-based casinos in New Jersey. New Jersey passed a law to formally legalize and regulate fantasy sports in 2017. Major operators such as DraftKings and FanDuel were already in operation at the time, but the 2017 law gave them firm legal footing and established a few basic regulations such as requiring all operators to properly manage customers’ funds and undergo annual audits. Traditional fantasy leagues held in the real world among friends remain legal in New Jersey under current laws. If the operator takes no profit, no license is needed. However, fantasy leagues run as a business do require a license just as DFS sites do. Horse racing betting is legal in New Jersey at racetracks, authorized off-track betting parlors (OTBs) and through licensed racing betting sites. All racing betting is regulated by the NJ Racing Commission, which is responsible for overseeing the racing industry as a whole as well as issuing licenses to betting operators. Bingo is legal under two circumstances in New Jersey. First, land-based casinos and gambling sites may run real money bingo games as a normal part of doing business. Second, recognized nonprofit organizations may host bingo games to raise money for charitable causes. Something to be aware of before you play online is NJ bingo sites host 90-ball bingo rather than the traditional 75-ball variant you likely played as a kid. The 90-ball format is played with the same basic rules, but the playing cards consist of three horizontal lines and nine rows as opposed to a standard grid. Typically, there are three winning patterns in a game of 90-ball bingo. First is to cover all the numbers in any one row, second is to cover all numbers in any two rows and lastly there is the full house: to cover all 15 numbers on your playing card. In-person bingo in New Jersey may only be offered by charitable organizations that have received a license from the Division of Consumer Affairs for that game. New Jersey has many bingo halls across the state operated by various non-profit groups, veterans’ associations, churches, volunteer first responder organizations and other charitable organizations. The New Jersey Lottery was approved by voters in 1969 and held its first drawing in 1971. Revenue generated by the NJ Lottery is designated for educational services, psychiatric hospitals, centers for the developmentally disabled and homes for disabled soldiers. 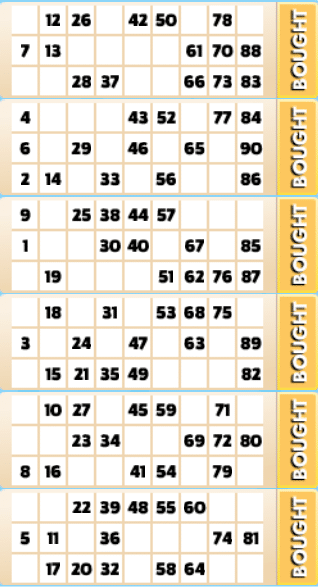 Today, the NJ Lottery offers a standard mix of draw games and scratch-off tickets. Online lottery sales are not approved in New Jersey; all tickets and scratch cards must be bought in-person at authorized retailers. Of these three categories, modern video games played for real money stand as the most popular by far. If you follow eSports, you already know the rapid growth of eSports competition has created an entire new industry worth billions. Games such as solitaire, Bejeweled and scrabble can also be played for money online at certain websites in New Jersey. The biggest website of this type of WorldWinner.com, which hosts smalls stakes contests for a variety of games. The market for online skill games of this sort is not the biggest in a state with legal online sports betting, gambling and poker, but nonetheless these games do remain an option if you enjoy the challenge of playing against other real people with money on the line. Land-based casinos in Atlantic City have been toying with the introduction of skill-based games recently in an effort to cash in on a younger demographic that just doesn’t embrace traditional gambling games to the same extent as previous generations. In late 2016, Tropicana and Caesars properties installed two skill games with variable payouts based partially on the skills of the players. One was a first-person shooter called Danger Arena and the other was a sort of Bejeweled variant called Pharaoh’s Secret Temple. Caesars ended up pulling both games after six months due to a lack of interest, but casino representatives say Caesars is still committed to the skill gaming concept. Right now, it seems, casinos are still learning as they go when it comes to skill games. New Jersey gambling laws address nearly every conceivable form of gambling ranging from land-based casinos to online sports betting. There is much to cover on this topic, but we’ll do our best to break it down in simple terms. New Jersey first attempted to legalize casinos throughout the state with a referendum held in 1974. Voters shot the proposal down by a wide margin, but gaming advocates went right back to the drawing board to find a new approach. The state took a another crack at gambling in 1976 with a second referendum that proposed authorizing casinos within the city limits of Atlantic City only. This one passed by a comfortable 56% “yes” vote to set the stage for legal gambling in New Jersey for decades to come. One year later, lawmakers approved the Casino Control Act to regulate gambling in New Jersey. The Casino Control Act in turn established the Casino Control Commission and the Division of Gaming Enforcement. While the Casino Control Act serves as the foundation of casino law in New Jersey, casinos are also subject to regulations adopted by the Casino Control Commission (CCC) and Division of Gaming Enforcement (NJDGE). Casino Control Commission: Responsible for licensing casinos and key employees and hearing appeals of decisions/penalties levied by the NJDGE. Division of Gaming Enforcement: Conduct investigations on license applicants, enforce gaming regulations and monitor licensees for compliance with all gaming regulations. Online gambling was legalized in New Jersey with the passage of A 2578 in 2013. Under that law, land-based casinos may partner with outside software providers to offer slots, table games and poker online to residents located within state lines. In short, New Jersey’s online gambling law permits just about everything you would expect to find at an actual casino except sports betting (which was legalized in 2018 with a different law). Poker is regulated in New Jersey under the Casino Control Act as an authorized form of gaming offered within licensed casinos. The NJ criminal code appears to prohibit all home poker games, but games hosted at land-based casinos are perfectly legal. Online poker is likewise regulated by the same laws that govern online gambling. Multiple legal poker sites operate in New Jersey today and offer a full range of cash games and tournaments. These sites may be accessed via PC, Mac and mobile devices. NJ gaming laws also permit poker sites to reach agreements with sites active in other states where online poker is legal. In 2018, New Jersey joined Nevada and Delaware in a player sharing agreement allowing any site active in two or more states to share players across state lines. Out of every state that has legalized sports betting to date, New Jersey had by far the most difficult, up-hill battle of all. When New Jersey began its long march toward sports betting in 2011, it did so under the specter of a federal law called the Professional and Amateur Sports Protection Act of 1992 (PASPA). Under PASPA, states were prohibited from authorizing or regulating sports betting. The only exceptions to PASPA were sports betting regulatory schemes already in place or enacted within one year of PASPA being signed into law. Nevada already had legal sports betting in place and so received the only full-scale exemption from PASPA. Montana, Oregon and Delaware also received partial exemptions for specific sports betting games, but Nevada had an absolute monopoly over actual sports betting during the PASPA years. It was in this challenging legal environment that New Jersey began its fight to legalize sports betting. It all began in 2011 with voters approving a ballot measure to authorize sports betting at casinos and racetracks. Lawmakers introduced the Sports Wagering Act of 2012 fewer than two weeks later and then-Governor Chris Christie signed it into law. In response, the NFL, MLB, NBA, NHL and NCAA sued Governor Christie and key NJ gaming officials to enjoin the Act. The sports leagues contended the Sports Wagering Act of 2012 violated PASPA, and New Jersey contended PASPA itself was unconstitutional as a violation of the anti-commandeering doctrine of the 10th Amendment. You can read more about the legal battle here, but in the end New Jersey emerged victorious after the Supreme Court found PASPA unconstitutional in 2018 and struck it down in its entirety. This is how New Jersey and every other state in the US gained the authority to legalize and regulate sports betting. One month after the Supreme Court overturned PASPA, New Jersey Governor Phil Murphy signed the Sports Wagering Law to finally bring legal sports betting to the Garden State. Daily fantasy sports (DFS) sites are legal and regulated by the Fantasy Sports Unit (FSU) of the Division of Consumer Affairs in New Jersey. Licensed fantasy sites are required to ensure all customers are at least 18 years old, properly maintain customers’ funds and undergo annual audits to ensure compliance with state regulations. New Jersey’s Administrative Code, Title 13, Chapters 70-74 regulate all horse racing throughout the state. The code itself makes for a dry read, but the gist of it is horse racing betting may take place at authorized racetracks, off-track betting locations (OTBs) and through licensed horse racing betting sites. The New Jersey Racing Commission meanwhile oversees the conduct of horse racing and betting throughout the state. Just a sample of the Commission’s duties include ensuring the safety of horses and integrity of racing, issuing licenses to track employees and owners, screening for banned substances and monitoring all betting activity. In 2013, the New Jersey Racing Commission chose horse racing media company TVG to manage the state’s only licensed betting site located at 4NJBets.com. TVG parent company Betfair also offers exchange racing betting through Betfair NJ. These are the only two racing betting sites authorized to take wagers in New Jersey. Bingo is regulated under one of two different sets of regulations in New Jersey. On one hand, bingo may be run as a commercial enterprise by casinos and gambling sites that are licensed in New Jersey. In that case, standard NJ gambling laws apply to in-person and online bingo. On the other hand, bingo may also be run as a fund-raising effort by recognized non-profit organizations. Charitable groups wishing to host bingo games must first apply for a license from the Legalized Games of Chance Control Commission. After receiving an identification number from the Commission, charitable organizations must then apply for a municipal license from the municipality where the game will take place. New Jersey voters overwhelmingly approved the creation of a state lottery through a ballot measure proposed in 1969. The State Lottery Law was passed shortly thereafter, and the first sanctioned drawing was held in 1971. The State Lottery Law established the State Lottery Commission and Division of the State Lottery in addition to outlining the basic rules governing the NJ Lottery. Under the law, the NJ Lottery is permitted to run drawing games and sell instant win scratch cards but is prohibited from offering games run by electronic or mechanical means – which means no video lottery terminals (VLTs). Additionally, the State Lottery Law permits the lottery to withhold an amount of winnings from prize winners equal to the amount owed on certain debts. If a prize winner is behind on child support, is in default on a student loan or has been overpaid by certain social benefits programs, the lottery may withhold any amount necessary to cover those debts. Skill games that do not meet the definition of gambling as defined by Criminal Code section of the New Jersey revised statutes are not subject to state gaming law. This means pure skill games, whether run in-person or offered online (such as eSports played for real money) do not require a gaming license. Casinos are also allowed to offer games of skill, but these games are subject to stricter regulations. Temporary regulations posted by the Division of Gaming Enforcement require skill games operated by a casino to clearly disclose the rules of the game and any features offered within the game that allow players to gain an advantage over other players, if any. Games that rely entirely on the skill of the player are not required to have a minimum return-to-player (RTP), but slot-style games that only include an element of skill must have an RTP of at least 83%. This means that for every $1.00 wagered, at least $0.83 must be returned to the player in the form of prize money. What is the gambling age in New Jersey? Does New Jersey allow lottery winners to claim prizes anonymously? No. The NJ Lottery identifies all winners and usually requires jackpot recipients to appear at a public press conference. However, a bill (S 2267) introduced in early 2018 sought to allow NJ Lottery winners to claim their prizes anonymously. Are gambling winnings taxed in New Jersey? Note: Before we answer this question, we need to make it clear we are not tax professionals. What you read here is only our understanding based on research. You should always consult a tax professional for issues related to taxes. Yes. New Jersey generally treats gambling winnings the same as ordinary income. This means your actual tax rate will vary based on your personal situation and annual income. NJ tax law also allows winners to deduct gambling losses but again, a tax professional is highly recommended. There are many quirks to NJ gaming law that can significantly impact what you owe and what types of records you need to keep. New Jersey offers resources for those who suspect they may have a gambling problem. Whether it’s you or a love one you’re worried about, there are people ready to help right now. The following resources are specific to New Jersey, but you can also see the bottom of our homepage for links to nationwide resources such as Gamblers Anonymous.